We live in an age where a huge library of film and TV show content can be yours at the click of a button, but once you’ve decided what you want to buy and keep forever, you’ve got a choice of where to get it from. Here we’ll explain the pros and cons of two of the biggest digital stores in the business, Google Play Movies & TV and Apple’s iTunes. You might already have a preferred place to get your content from, but these two media storehouses have different apps, different libraries, and different ways of working. If you’re buying something for life, then you want to make the right choice. Let’s start our analysis with the apps: Google being Google, the easiest way to get at Google Play Movies & TV is on the web. Points for accessibility then, because you can load it up on any computer, running any platform, as long as it has a web browser. Your movies and TV shows can also be played in any web browser on any computer, which is simple enough. What you might not know is you can also get at your purchases through YouTube, if you’re signed in with the same Google account—the link is on the navigation pane on the left of the web interface. 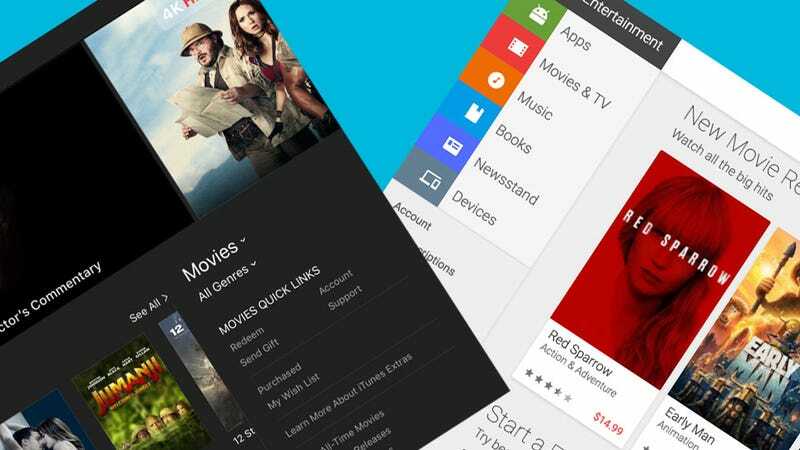 Outside of the browser, Google Play Movies & TV is available on Android and iOS. You can watch your stuff through both, but you can’t purchase anything on iOS—you’ll have to buy your content elsewhere before watching it on iOS. Offline syncing is available in both cases. On top of that, Google Play Movies & TV is available on Android TV, as you would expect, and works seamlessly with Chromecast devices. There’s an official channel on Roku’s platform, but no official app for the Amazon Fire TV sticks and boxes. Another device you might want to use Google Play Movies & TV with is the Apple TV. As with Amazon’s hardware, there’s no official app here, but unlike onAmazon devices there is an official YouTube app available for the Apple TV. It will at least let you watch your purchases. Alternatively, you can use AirPlay to beam over content from the Google Play Movies & TV app for iOS. All of Apple’s hardware devices come with iTunes support built in too. That includes the iPhone, the iPad, the iPod Touch, and the Apple TV. Unlike Google’s apps, which stream content by default, iTunes content is downloaded locally—though you can start watching mid-download. You can’t, however, view videos from iTunes on your Apple Watch, but you didn’t seriously want to, did you? At the same time, iTunes Store support is lacking on non-Apple hardware devices: Anything running Android, and streaming devices from Amazon and Roku. You can’t even watch your media on a Chromecast, because the iOS player lacks the casting function. If you’re going to buy films and TV shows from Apple, you’d better be fairly confident you’ll only ever watch to watch them on Apple devices or Windows computers. Last but not least are consoles. You may well have a PlayStation 4 or an Xbox One under your TV screen, so what’s the situation there? It’s just about impossible to get your iTunes movies and TV shows over to a console, without a lot of effort and a sketchy conversion app or two. Google Play Movies & TV content is easier to access, because you can go through YouTube as we mentioned above, but there are no official console apps for the Google Play Movies & TV store. It’s no surprise that titles purchased from Google are easier to access on more platforms and more devices. There are some restrictions on which formats can play on which types of hardware though, which we’ll get into in the Formats section below. On the desktop, the iTunes Store packs in plenty on each screen, and gives you a host of different options to pick from besides, you know, just searching for what you want. You can browse new releases, browse by genre, see what’s popular with other users, sift through movies and shows by price, and check out content recommended for you. Drill deeper into anything in the library to see a review, a description, user reviews, trailers (where available), and related titles. Everything is clearly laid out and well presented, and it’s almost like a little IMDB (only with better visuals). Google Play Movies & TV on the web does what it always does with interfaces: It’s clean and it’s fast but it’s pretty sparse. It’s easier to jump around between pages, but you don’t get as many ways to navigate around the library, and you can’t see as much on screen at the same time. You can still browse by genre, popularity, and release date, as well as check out titles Google has recommended for you. That same simple-but-sparse approach extends to individual pages for movies and shows. You get a description, reviews, a cast list, and a trailer (if there is one), but everything’s a little more awkwardly laid out—just not enough that it would put you off using it. Thankfully the search feature is a breeze to use. Moving on to mobile apps and actually watching your content, the same principles apply. Apple has introduced the Apple TV app on iOS for taking on viewing duties, although the iTunes Store app still handles some of the purchases—it’s a bit fiddly switching from one app to another but the app itself is clean and simple. Getting at your movies and shows is no problem at all. The Google Play Movies & TV apps manage browsing, purchasing, and buying, and are a bit more bare bones, though we do like the info cards that pop up when you pause something to show you who’s on screen. The apps from Google and Apple both stick to the basics of playback and bringing up captions and so on—there’s very little here that would make you choose one over the other. Starting with new releases, at the time of writing both digital storehouses were showing the likes of The Last Jedi, Thor: Ragnarok, Jumanji: Welcome to the Jungle, and Murder on the Orient Express. What’s more, price levels and rental availability seemed to match up pretty exactly between the two, as far as we could tell. Next we had a look for critically acclaimed 2017 South Korean film The Handmaiden—present and correct on both platforms, for the same rental and purchase prices. John Hughes’ 1987 Thanksgiving classic Planes, Trains, and Automobiles? Also available in both stores, for the same price. Diving into TV shows, we looked first for the big hitters. Google and Apple will sell you all seven seasons of Game of Thrones, for the same price; you can also buy digital box sets of The Walking Dead and The Office (US Edition) from both places. Prices match on The Walking Dead, though iTunes is currently selling the adventures of Michael Scott and company for a knock-down price—perhaps an example of a temporary sale. The first season of Westworld is available on both the iTunes Store and Google Play Movies & TV, though here Apple was slightly cheaper. Neither store had the first episode of the second season available yet, at least in our part of the world. What about older stuff? Again, it was pretty even. The three seasons of the original series of Star Trek could be found in both places, for the same prices, but we couldn’t find a digital version of classic cop show Columbo anywhere. At this stage in the digital content game it seems both Apple and Google have access to very similar libraries and have very similar deals with the bigger studios. It’s only if you’re after something very specific that you might have to choose between one or the other. Both these digital stores are making their first steps into the world of 4K/Ultra HD and HDR support—which is to say, a lot of the new stuff will come in this format, but a lot of the old stuff will be stuck with plain old 1080p HD. As with the library as a whole, the choices are just about identical. The Last Jedi is currently available to buy or rent, in 4K HDR or SD, from Google or Apple; Baby Driver is available to buy, in either format, from both places too. Again the prices match right across the board. If a film is available in the top format, chances are you’ll be able to get it from either place. Try as we might we couldn’t find any older films or any TV shows at all with the 4K UHD or HDR labels attached, so this seems to be a slow and steady roll-out. Even the top programs from television aren’t available in the best formats right now. The iTunes Store has a couple of significant advantages here though: For one, it’s automatically upgrading any HD purchases users have made to 4K UHD, where available. Google has yet to follow suit. Secondly, at the moment 4K HDR content from Google Movies & TV can only be played on the Chromecast Ultra and some Android TVs (like the Nvidia Shield), whereas iTunes Store users can pick from the 2017 iPhones and iPad Pro, or the 4K Apple TV. Finally, then, which digital store is better? Well, it’s complicated. We’ve just mentioned that 4K HDR movies from Google Play Movies & TV can only be played on a select number of devices, and with its auto-upgrade policy, Apple seems to be leading the way in terms of new content in the very best quality. Cinephiles take note. On the other hand there’s the usual warning about anything you buy from Apple: It might not work all that well with your non-Apple gadgets. Are you sure you’ll never want to watch one of your iTunes movies on an Android phone, or in a web browser, or on a Chromecast? If you take the Apple route, you have to commit to it—which will be no problem at all for some of you. Buy something from Google and there’s a slightly better chance it’s going to work with whatever TV and mobile kit you’ve got in ten years time, or round at your friend’s house. Ultimately its down to what you’ve already put your time and money into. The best choice for you is probably the ecosystem and the devices that you’ve already invested in most heavily. But should you find yourself wanting to flip from Google to Apple or vice versa there is at least one solution: Movies Anywhere. It can take movies bought from Apple and Google and get them playing on just about every device out there, including Amazon hardware—but it’s only for films right now, and it’s another service to sign up for.